This piece was entirely inspired by reading Koldo Barosso’s wonderful blog posts on the process of creating an album cover. 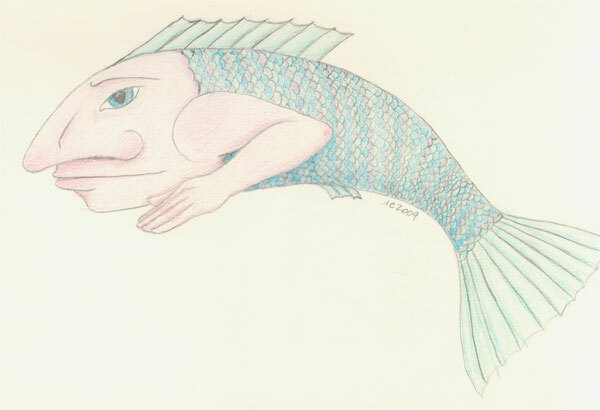 The flying fish with a man’s face stuck with me, and the image of this man stuck in my head until I got up late one night and drew him, coloring his scales on a couple of subsequent late nights, using some old colored pencils. Something about the shape of his nose, the angle of elbow and arm and hand against his fishy body called out to be brought to life, and I just couldn’t not draw him, once his image popped into my mind.